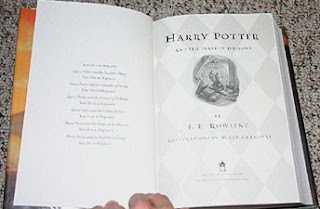 I’m really not trying to make this the one true Harry Potter blog, but I have to remark on the jackass who took the trouble to (a) obtain J.K. Rowling’s latest tome days before its official release date, and (b) take a digital picture of every freaking page, for the express purpose of posting it on the Internet. Remember, this book is close to 800 pages long. The sheer idiocy of this is incredible enough, but even more astonishing is the fact that tens of thousands of people — I’m going to guess most of them are also mouth breathers — actually downloaded every poorly shot page, presumably to read the book on screen, thereby gaining a huge advantage in prestige and wisdom over the poor saps who elect to wait until the official release on midnight Friday. Boy, nothing like curling up with some blurry pictures of text and a cup of hot chocolate, is there? It’s sure good to see people reading. Idiocy, perhaps, but thoroughly expected considering the hype and the secrecy that the book’s publishers and publicists have taken great care to create.